The world’s first epilator and cleansing brush system. Treat your face to flawless radiance. As well as including Braun’s best Wet & Dry epilator for long-lasting smooth skin, the set comes two exfoliation brushes for gentle and deep body exfoliation. 3Braun Silk-epil 9 Epilators - featuring Jessica Alba! Silk Epil 9 Wet/Dry Epilator 4 in 1 Hair Removal and Exfoliation System with 6 extras is rated 4.8 out of 5 by 74. Rated 5 out of 5 by Rayles from Fantastic Product All Round I agonised over which Epilator to get and read many reviews but am 100% happy with my purchase. It is faster than others I have had, grips and pulls out the hairs by the roots. In terms of pain level it is also the best I have tried and comes with a massage head that you use whilst epilating which helps with this. It has a very bright light which is great. It comes with extra heads which to be honest I have not tried yet but I am so happy with this Braun Silk Epil 9. I have only tried this product Dry not Wet. Can highly recommend it, I love it. Rated 5 out of 5 by beans from Excellent epilator I have had the Silk Epil 9 wet/dry epilator for 1 month now and am more than happy with it. It works even better than waxing and the exfoliator attachment is amazing and leaves my skin fresh and clean. I also use the massage attachment which helps with circulation and minimises cellulite - and the fact that all of this can be done wet or dry ensures that you can get the outcome you want with the least amount of discomfort. This is really great value for money for all of the things that it can do and I would recommend it to anyone. Rated 5 out of 5 by Emmy Lou from The tamer of “THE BEAST” After reading the many excellent reviews of this little beauty, I had very high hopes but WOW!! How have I gotten this far in life without it? It is just like waxing, only a million times easier, cleaner and so convenient. You have control of the process and it’s very easy to go back if you’ve missed a few hairs. The battery life is great, I managed to do two whole legs, with their full winter coat and it still wanted to keep going. I love everything about this product and will never have a hair on my body ever again!! Rated 5 out of 5 by Rabbitouse from Awesome epilator with many functions This epilator works so well. My previous epilator was Pansonic and I have been using it for 5 years before I change to the Braun Silk Epil 9. My previous epilator cannot remove very fine body hair (on my forearm), but Silk Epil 9 works like wonders! I also never imagined the LED light to be so useful but OMG it makes the hair removal so much easier under my dim bathroom light. Loves that I can use it in bath and dont have to worry about soaking it in water. Plus its comes with additional accessories. Couldn't recommend more. Rated 5 out of 5 by TayTay from Why didn’t I buy one of these years ago?! I’m so happy I finally went out and bought one of these. Have pretty much used it everywhere since purchasing it about a week ago and have not had an issue. It effectively pulls out the hair and is so quick and easy compared to waxing. Yeah it hurts a bit, obviously, but after the first few couple of swipes you adjust to it and you sort of just go a bit numb. When you think about how much you spend on wax, razors and hair removal cream, the epilator will save you so much money in the long run AND more importantly TIME! Rated 5 out of 5 by Vy.N from First time user with great results . I bought this two months ago and it's my first time using an epilator. I did a lot of research and when I saw this at such a great price I had to take the plunge. I exfoliated first with the brushes and then used it on my legs. It did sting but pain was tolerable. Since then I used it without exfoliating and it caused red spots so lesson learnt. It's been two months and the hair has grown back finer and lasts around two weeks. I really recommend this , it's so much better than shaving . Really good product. Rated 5 out of 5 by Cathode20 from Legs feel so nice and silky I’ve only had the silk epil 9 for a few weeks, it’s my third silk epil I’ve owned in 20 years, and it’s the best yet! My legs are so soft afterwards, pulling all hairs out not just breaking them (my hair is fine seeing as I’ve never shaved only ever used epilady or silk epil’s). I use it on my underarm and bikini too, the head moves with the different area’s and hasn’t caught any skin. There is no pain when pulling hairs out but I may not be the best judge of that seeing as I’ve used them for years. Rated 4 out of 5 by kls127 from Does a pretty good job I purchased this mainly for legs and bikini line. It does hurt in the bikini-line area when first using. I just did small spots at a time. I did not really find any difference using it in the shower or using it dry. The second time I used it I knew what to expect and I just went slowly and managed to get all of my bikini line, just on the inside of bikini, done without too much trouble. Legs are a piece of cake, just feels like little pin pricks and its a sensation you soon get used to. It only took slightly longer to do my legs and bikini line as it would in the shower with a razor. It did seem to miss some of the very fine hairs on my upper thighs so I had to go over these spots a few times. It was nearly 2 weeks between my first and second use before I need to use it again so well worth the investment. Which accessories/heads does the Silk Epil 9 ($199) come with? Exfoliating brushes; one for legs and body, the other for sensitive areas (not for face). Shaver head with trimmer. Epilating heads; massage (the one that pivots), and usual/ faster head. The pictures on the website are misleading, it's better to use the model number and look at Braun's website. This model DOESN'T include any facial attachments (annoying since that was my main reason for purchasing). 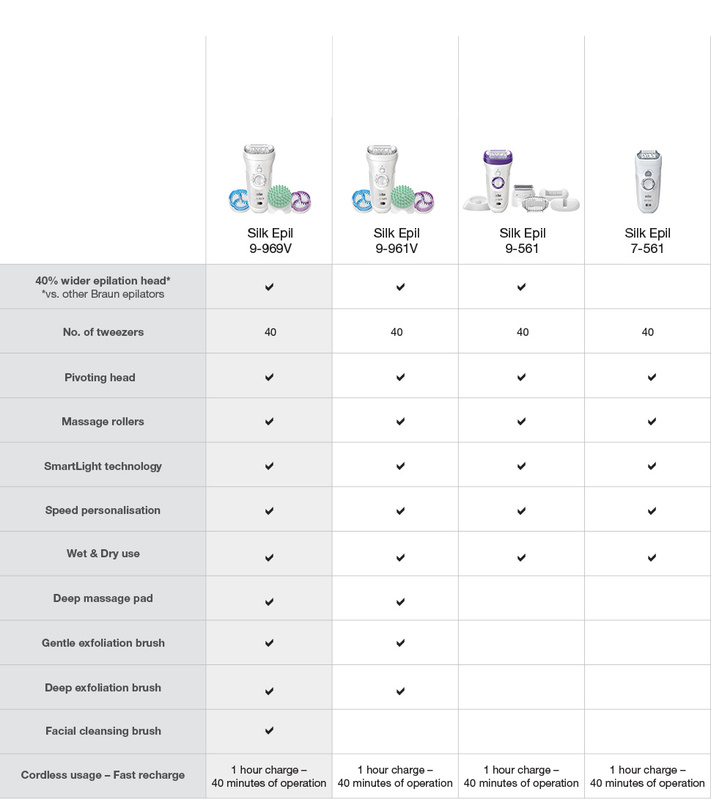 Just a note: from my experience Braun lists the unit, less any attachments, as the epilator. Everything else (like the tweezers heads needed for epilating), are listed as attachments. So the unit needed for epilating might be listed as 2 attachments: the tweezers + the cover. The exfoliating brushes as 3 attachments: the head for the brushes, and two brush heads.